I start with a drawing which I transfer onto the linoleum block using indelible ink. 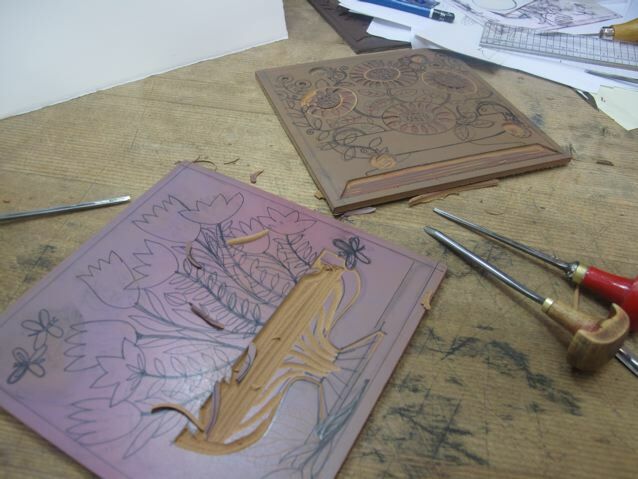 The first photo shows the designs drawn on the block and the gouges I use to cut out the design. 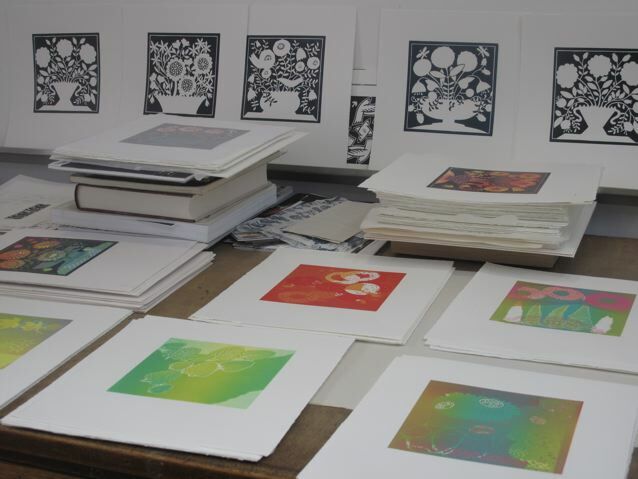 The next stage is to decide the edition size especially when making a reduction print. Most of my editions are between 20 and 30. The second photo shows all the prints piled up on my plan-chest. Some are finished, others waiting for another layer of colour ink. Also blocks printed in black. With these flower prints I experimented in the first two or three layers by printing from leaves, thread, lace, paper doilies and stencils to create some interesting textures. 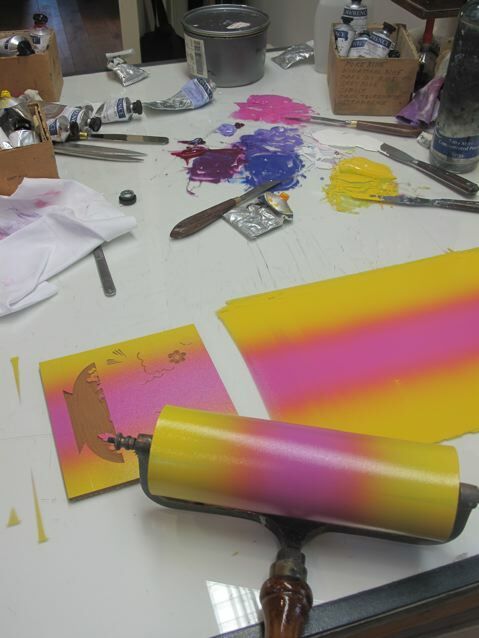 The third photo shows ink rolled out on the glass and the block inked with the ‘rainbow’ colour ready to go in the press. 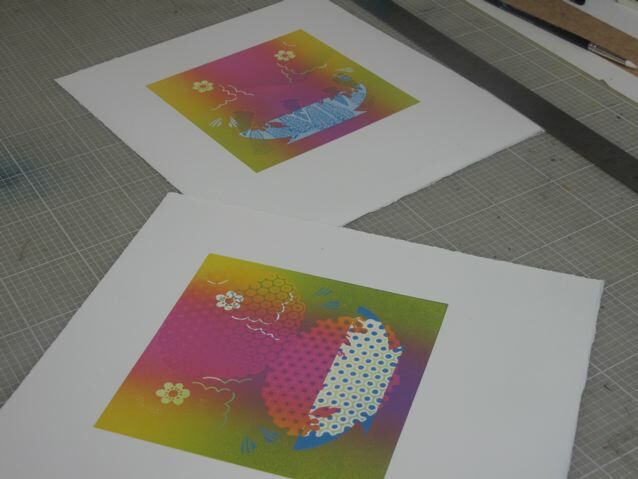 The fourth photo, the ‘rainbow’ colour printed! Between each printing I cut away more areas of the lino block to describe the design which slowly translates to the paper with each layer. The inks I use are oil based and come in a magnificent array of colours which can be mixed to give an infinite number of colours! Using gradations of colour, as shown in the ‘rainbow’ inking, means you can introduce more colour! 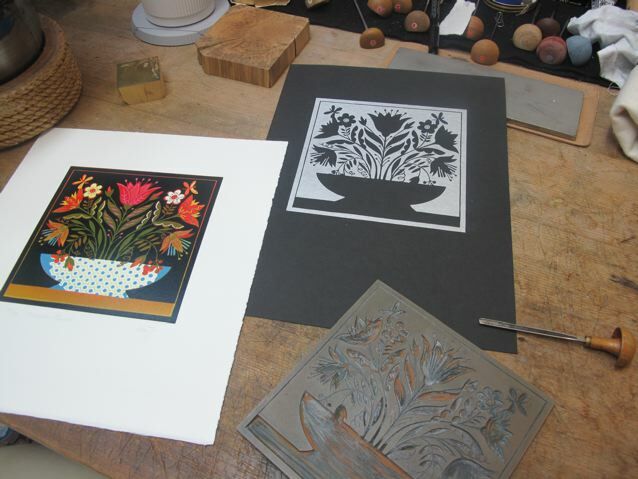 The final photo shows the finished print in colour, the cut block and a print showing the block printed in silver on black paper. 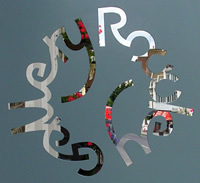 Each print has six or more layers of ink – think of a sandwich. The flower prints are a ‘variable edition’ because each print has subtle differences as a result of the experimental use of materials and colour in the early layers but I have brought the design together with the cutting and the last two colours. Hope all this makes sense – so difficult to describe! Best wishes, Linda. 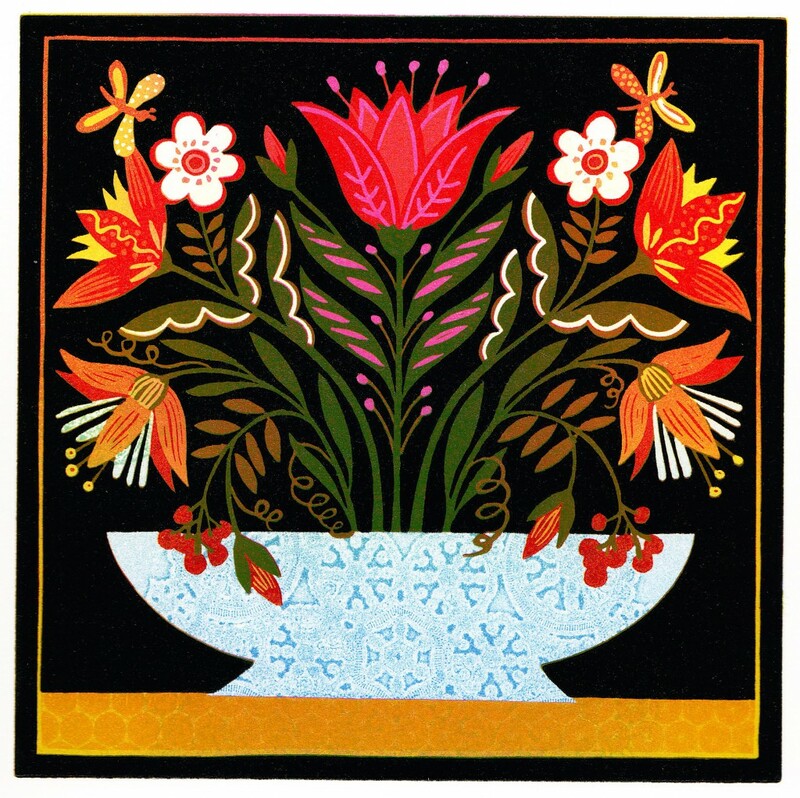 This entry was posted in Art, Flowers and tagged Flower Power, Linda Farquharson, Linocut, Printmaking. Bookmark the permalink.